How do you deduce that a child has an ear infection? I had terrible ones as a young thing (my dad smoked a lot), but my mother didn’t always know I had them until they were rather far along. How will I know when my baby has one? What are the symptoms? Since ear infections are the most common diagnosis in pediatrics, it is worthwhile for a parent to learn to become a Sherlock Holmes, able to notice the clues and suspect an ear infection before it becomes advanced. Detecting an ear infection in your child requires some basic information. First, let’s dispatch with a red herring. You’ve found a clue — you notice ear pulling in your child under age two. What does this tell you? Shockingly, careful studies (e.g. Pediatrics 1992; 90:1006) have found that 0% of children with ear pulling as the primary sign had ear infections. Even in conjunction with other important clues, such as fever, only 15% of those brought in for ear pulling actually had ear infections. Most commonly, children pull their ears from itching (caused by soap or shampoo in the canal, or by a healing infection), teething, exploration, comfort, or habit. You are now already ahead of the crowd. Ear pulling is one of the most common reasons for pediatric office visits. The pain builds as the pressure in the ear builds, from a dull ache to a sharp stabbing pain. The pressure is relieved intermittently, so the pain comes in waves. The pain is worse at night. In an older child, “My ear hurts!” is the most reliable clue. Most ear infections, however, occur in children under age two. In younger children the best clue is evidence of pain, such as crying or screaming (usually less than half an hour), fussiness or irritability (worse when lying down), or suddenly increased difficulty sleeping, especially at night. They often have no pain the following morning. Older children often mention a feeling of fullness or decreased hearing in the affected ear. This is difficult to detect in an infant, but you might notice shaking of the head. Temperatures over 104 occur in fewer than 5% of ear infections. Fevers are more common in infants and toddlers than in older children. By itself, a fever is not a powerful clue – but in conjunction with the clues outlined above, it is quite incriminating indeed (the combination of fever and pain is most often an ear infection in infants and toddlers). Other Suspects: Don’t let other symptoms, such as loose stools or vomiting, throw you off the trail when detecting an ear infection. Ear infections are sometimes accompanied by systemic symptoms. Accomplices: This job cannot be pulled off alone. 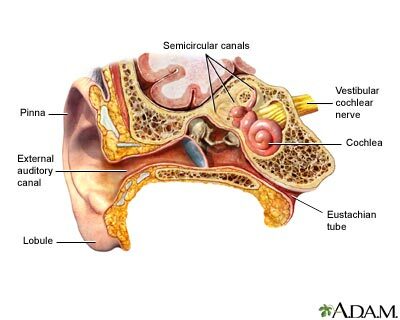 Something must plug the eustachian tube for an ear infection to occur. Most commonly an upper respiratory infection is the culprit. The accomplice might also be a change in elevation, allergies, an irritant (such as cigarette smoke), reflux, or drinking a bottle while lying on the back. The Scene of the Crime: Throughout the United States, and in the United Kingdom, ear infections are markedly more common in December through March. Their incidence is particularly low from July to September. The Trial: Even with the above clues, only objective evidence can clinch the diagnosis. There is now a wonderful device that uses sonar-like technology to detect fluid in the ear. The device, called an EarChek, is inexpensive, accurate, and simple to use at home. If there is no fluid, there is no ear infection. If fluid is present, only direct visualization of the eardrum by a skilled observer can determine if this is an acute ear infection. Remember, it is possible to have an ear infection in an infant with no clues. Here, a positive reading on the EarChek may be the first sign. CellScope is another home device that aids you in detecting an ear infection by allow you to use your smart phone to check your child’s ears when you suspect an ear infection. You can then send videos from your CellScope to their doctors for an evaluation within two hours. Also, regular well-child pediatric visits in the first two years screen for these silent episodes. Let’s try our hand at sleuthing. Which of the following two cases is more likely to have an ear infection? Click to find the answer. Case 1: A ten-month-old girl, who had been sleeping through the night, has now been waking up each night for one week. She pulls herself to standing in the crib, and rubs her right ear. She calms quickly when picked up by her parents. Case 2: A seven-month-old boy has had a cold for three days. Last night he woke up screaming, and remained irritable for several minutes even when he was picked up. He felt hot to the touch. This morning, he seems completely fine. How did you make out with the sleuthing? Did you guess the correct answer? Let us know below. Dr. Greene, my 1 year old daughter keeps shaking when I sit her on the floor so she can play but she cries as she crawls to me or her father, she doesn’t have a fever but she’s hot when I pick her up and she wants to stay near me or her father and doesn’t want to be put on the floor. I am having the same problem with my little one…..
Did you find a solution for it, if so please let me know…. My 1 yrs old daughter keeps getting up at night and crying for 1 hour even more and scratching her ears. What shall I do? My one yr old grandbaby always pulls at her ear and sometimes slaps herself on both sides of her head,the doctors say her ears are fine,but the doctors where I am from In Harnett County N.C. are not very smart. Many times I’ve told them what my kids had when they didn’t know. So,what do you think it may be? Thanks! My eight month old son has been pulling his hair and scratching his ear for three days now. I have developed a cough with mucus so I’m wondering if he is now sick? Can someone please help me I am a first-time mother! By now, the doctor’s office has opened and you are likely already in good hands. As a mother, I know how disheartening this must be, especially on the eve of your vacation that includes a flight. Hello, our 9 month old baby has been seen twice by the doctor. She doesn’t have a fever, but she is constantly itching both ears, even through the night. The doctor says her ears are clear but took out some earwax to reduce the itch. The itching is the same since, if not worse. We have both been sick and she is definitely teething, but I really think it’s more than just the normal teething referred pain. I was diagnosed with an ear infection, along with strep and a bronchial infection. I am in my second round of antibiotics so I am hoping she doesn’t have any of that. What should I do? Should I keep taking her back to the same doctor? Doctor, my 5 years daughter suddenly wakeup and crying all night in earache, this is the third time I see her.i cleaned her ear nothing there.she rubbed her right ear and crying.what am I do.plz tell me. Dr. Greene wrote a great piece that talks about different kinds of ear infections and the treatment that is right for each type. Hey dr. Green I had a ear infection in my left ear the wax is running out of both but my right feel clogged up do you why it is like that? My daughter is 23 months and she has randomly grabbed her ears, covering them up and crying drastically 3 times within a 3 month time frame. It seems as if something is irritating her, but i can’t figure it out. Her peditrician says it’s a ear ache, but i think it’s more. Any suggestions? My daughter just turned one on the 8th. In september i took her to urgent care because was pulling on her right ear and was running a fever (102.3). She was put on amoxicillin. Two days later she a lot wasn’t getting any better and she was admitted to cook wasn’t and we stayed for 5 days she wasn’t eating for drinking, had a double ear infection, got really dehydrated, blood sugar were in the 40’s. They did everything thought the IV’s. so i could conutine the medicine when we came home. I though she was getting better. Two weeks ago, fever came back, pulling on the ear came back. Back to urgent care we went. They flush her ears out, she still had an infection in both ears. Gave her Augmentin (twice a day for 10 days). And shes still pulling on her ears. Her Pediatrician doesnt seem to be worried at all. He wasnt even the one to tell the she had an ear infection. COOKS URGENT CARE DID. My 1 month old baby girl keeps grabbing at her right ear constantly, no other signs of an ear infection though, no fever, diarrhea or change in her behavior just constant ear grabbing. Should I still set up an appointment with her pediatrician or do babies sometimes grab their ears for no reason? It’s wise to keep an eye open for the development of additional symptoms, but if she’s just grabbing her ear, you can relax. My 2year old just had tubes put in both of his ears a month ago. Here recently he has been yelling that his ears are hurting, he’s not eating as much as usual, and he constantly acts like he is sick or just extremely tired. Could this be another infection? Should I go ahead and call his surgeon/ear Dr or just his Ped.? Poor little guy. Sounds like it’s time for follow-up. I’d start with his pediatrician. Can my 3 month old have a ear infection ? …she’s trying to pull her right ear recently had diharrea cranky mainly at night. Has a sore throat help! Sounds like it’s worth having her pediatrician take a look. It may not be an ear infection, but may. Even if it is, her pediatrician may recommend no action other than comfort measures so her body can fight it off. Hi.my 1 year old has a cold ..she has a runny nose and gets irritable at night cries like she’s in a lotof pain.shes also got a runny tummy aand is rubbing her right ear a lot. I suspect it’s an ear infection.im very worried should I take her to the paed? My 3year old cried all night for her head, she vomits almost everything she consumed that particular night and had a very high fever. What home remedies can I use or what other measure can be implemented to have this solved the fastest way?? He has been eating these until last week. From Friday, the last week (29th Apr) he started vomiting all the food he eats and then got 101 degree fever on the 30th Apr. From the 1st of May he has severe cough and cold. And the past three days he didn’t eat anything at all and whatever he eats he keeps vomiting it. Today he didn’t pass stools and peed only four times from the morning. My daughter keeps rubbing her ears often. Mostly the left n sometimes even the right n when I made her ly down on my lap n see there s a dark brown color filled on both her ears. I told this to my pediatric n he suggested solid as drops to melt the wax in her ears but then it did not melt n come out as I expected. Suddenly after a month or so when I made a take head bath, the very next day she was rubbing her ears badly n asked me to use bids on her ears. I tot she just got influenced vying seeing her dad using it n so she wanted to try it on her ears. But when I just made her ly down on my lap n saw there was dark brown wax coming out like threads but not exactly like threads. So I cleaned them only on the outer n slight inner area without putting the buds much inside her ears. But now almost a month again she started rubbing her ears n i see that there is a dark brown fully blocked the ear but little inside n so I’m scared to clean it with buds. Please let me know whether it is an ear infection or the pain n rubbing irritation is caused by the wax present inside. To mention she often gets cold n cough which makes me more worried. Sorry for the long post. Just worried about her. Waiting for your help on this. Thanks in advance. As a mom, I don’t think this is an ear infection, which is behind the ear drum. It sounds like she has an unusual ear wax build up. It makes sense to try what your doctor suggested again. It may take several applications to actually get the wax out and she may need regular applications. If she was my child and it didn’t resolve, I would take her back to the doctor. I suspect my son and daughter have an ear infection. My oldest daughter was just diagnosed with an inner ear infection. She is 5. She told me her earring hurt and I needed to take it out and clean her piercing and earring. I had just done this the other night and knew it couldn’t have been that. So we discussed further why she needed it cleaned. Three days prior she started with a runny nose that eventually led to coughing, running nose, and upper respiratory virus. She had a 100° fever as well. Now my younger daughter is cranky with the same symptoms. She just begun waking up frequently crying out in her sleep. And my son is doing the same as well with an additional symptom of not taking as many ounces. I am mom and he always settles down with me however he seems to keep crying to the point of breathlessnes and then being okay. It is exhausting for them! They both have fever. I will be taking them to the clinic super soon! I am a highly qualified early childhood teacher. I have noticed occasionally, toddlers that appear to be more wobbly on there feet than usual. These children fall over quite often. They are also grumpy! Sometimes they have a high temperature in only one ear. When these symptoms occur I refer them to a doctor. Most often they have an earache. Thank you for your article. Sir, my baby cries a lot when we touch her right ear from the outside. The doctor says no ear infection. Pls suggest. Case 1 is a dead link. Based on the other I assume its a ‘no ear infection’ answer.